After downloading and installing the app to your computer, open LyricsXpert (doing this will also open iTunes if it isn't already open on your computer). 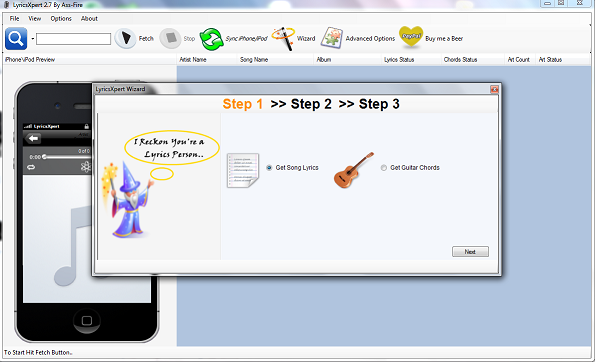 Use the wizard to easily import and embed lyrics to all of your songs. Choose if you would like to see just lyrics or lyrics with chords. If the album artwork is available, it is automatically part of the package! Click on "Next" to continue. Next, choose if you would like to save and embed the lyrics into your iTunes, or if you would just like to preview them through the app. Note: you must embed them into iTunes in order to view them on your iPod/iPhone. Click on "Next" to continue. 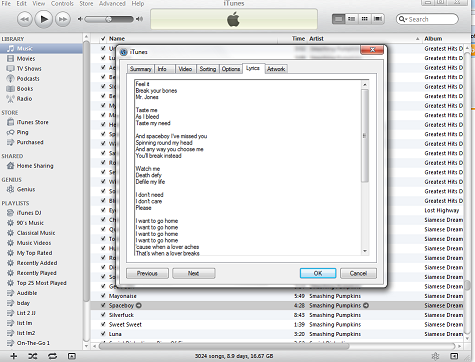 Choose if you would like lyrics to all the songs in your iTunes library, or just a specific artist. Click on "Finish" to start! Now the lyrics to your songs will be viewable by clicking on the song in the LyricsXpert app as well as in the lyrics tab in iTunes. A Green music mote means the lyrics were found and embedded, a Red music note means that the lyrics to that song were not found in our vast database (a rare occurrence). 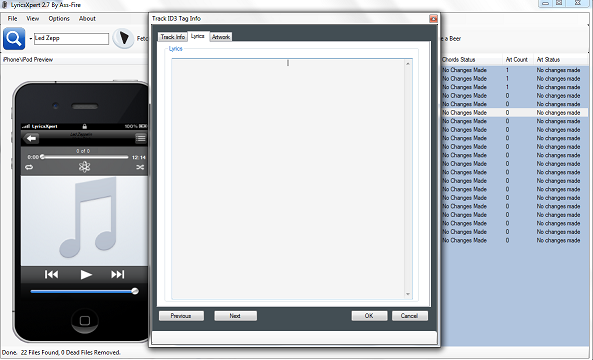 Use LyricsXpert as many times as you want or every time you add music to your library! If you add music to your library later, and don't want to update your whole music library again just to get the new lyrics you need, use the Search Field to look for specific artists, songs, or albums. Type in a little bit of information and click "Fetch" to begin searching. 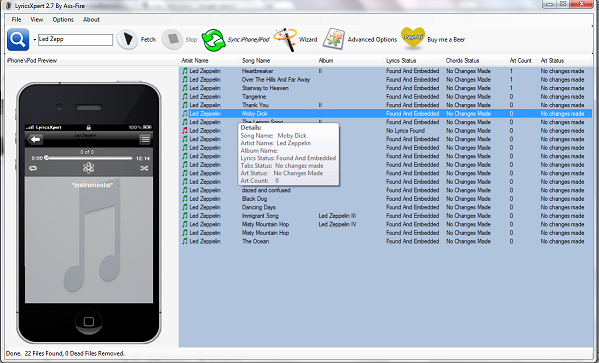 Every time LyricsXpert performs a search, it automatically updates those songs with the most recent file. Add missing lyrics to the database! Want to see the Red Music Note turn Green? You can by adding missing lyrics to the database! When you find a song that has a Red Music Note, right click on it and click on "Get Info" when the menu pops up. With the info box open, click on the "Lyrics" tab. You can either use the button to search the web for the missing lyrics, or you can do it manually on your own. 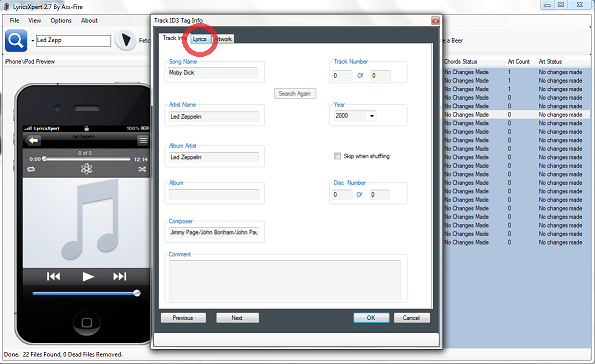 Click inside the text box to type or cut and paste the missing lyrics into the database. You can type as much or as little as necessary. Click on "Ok" when complete. Now you have successfully added the missing lyrics to the database! The music note will turn Green and the added lyrics will show up in the example iPhone to the left of the screen. LyricsXpert automatically syncs with your iTunes. Now all you have to do is sync your iPhone, iPod, etc. as usual with your iTunes to get the full experience of listening to music and viewing lyrics together on the go! contact us and we will do our best to answer!